Mix all the burger ingredients together in a bowl lightly with your hands to thoroughly mix them all without compressing the meat too much or the burgers will be dense. I find with this leanest of minces you do not need any egg or additional binding additions they hold together perfectly well on their own. Divide the mixture into 4 even meatballs & shape into rounds, flattening them down lightly to form 4 burger patties. Spray a pan with spray oil & when it’s preheated & hot fry the burgers for approximately 8 minutes each side over a medium hear until cooked through. Fry the eggs in sprayoil when there are only a few minutes left on the burger cooking time. 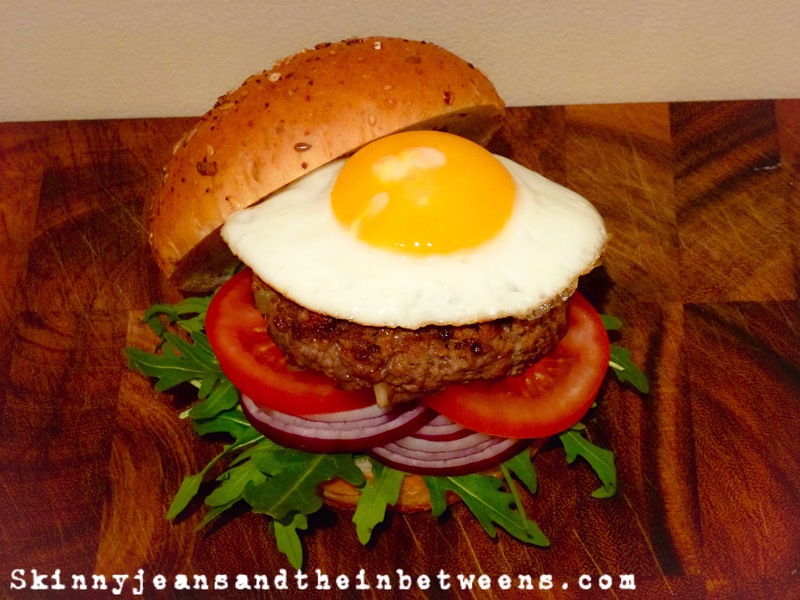 Assemble the bun garnished with rocket, red onion & tomato slices & top with the smokey burger & velvety egg and Enjoy! There’s that great fried egg again! I’m trying to figure out how you get it fried so that the white is thoroughly cooked (at least, it looks that way) but the yolk still looks like it’ll be runny. Obviously the bottom of the egg must be crisp because it’s not flopping down the sides of the burger. Do you just cook it on one side and put a lid on the pan? If so, how do you keep the yolk from cooking through? It just looks like the perfect fried egg!